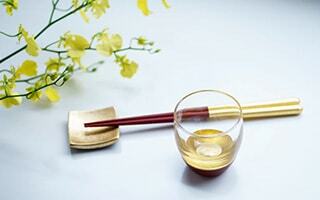 “Eternal sake glass for your lifetime” is an exclusive glass for Japanese sake. 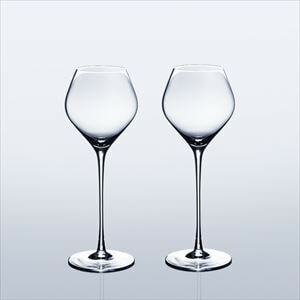 It has smart and polished form and long stem. 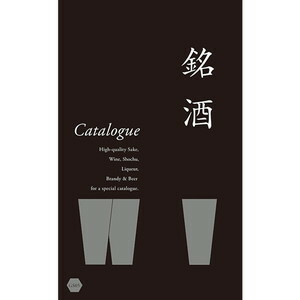 Only skilled craftsmen can produce this stylish sake glass. The 3 types of sake glasses are made for a kind of Japanese sake. So, you can use different glass for different Japanese sake. 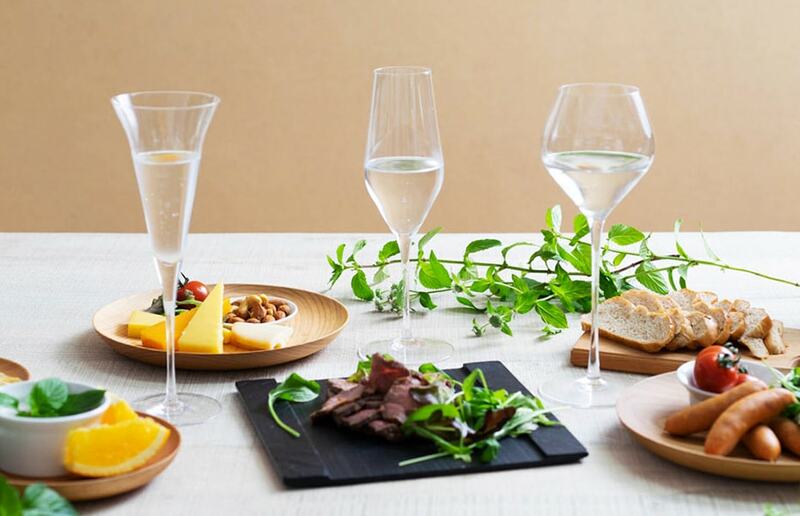 The sake glasses are exclusive use for Japanese sake, but of course, you can use the glasses for wine or champagne. 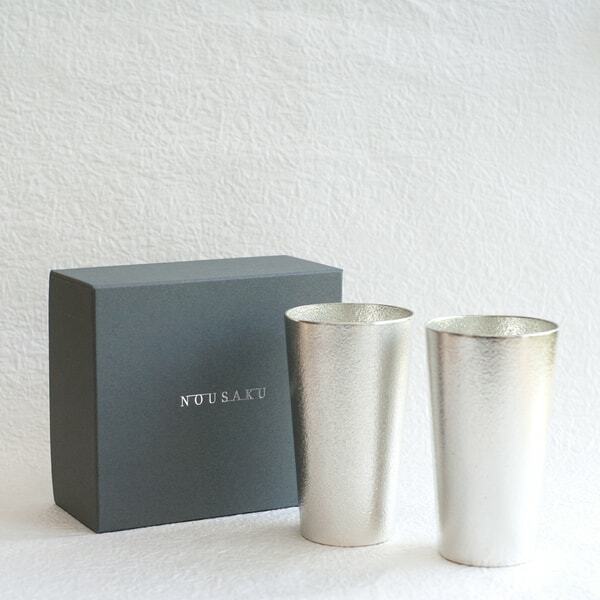 The stylish sake glasses have been popular for wedding gifts or presents for sake lovers. In fact, this “Eternal sake glass for your lifetime” has got attention from the world of design and products. One reason is their history of winning awards. 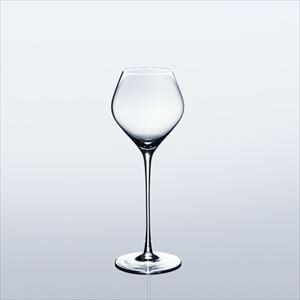 Since Wired Beans announced the glass in 2010, it won many design awards in the world. 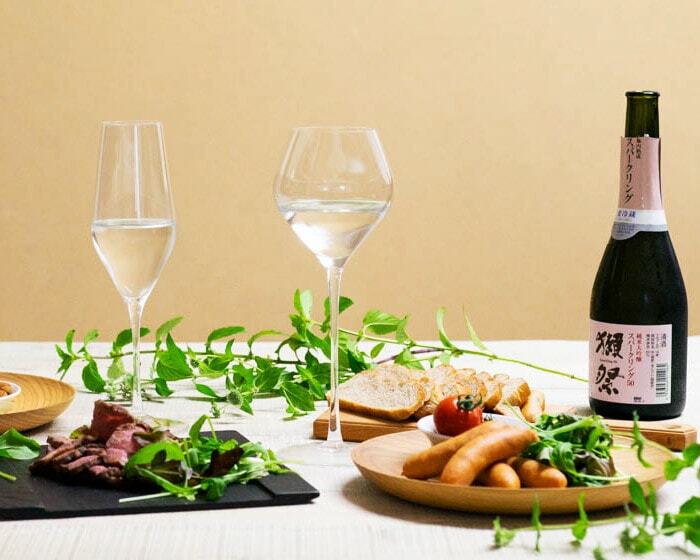 As the name explains, the sake glasses of Wired Beans have “lifetime compensation.” It means, if customers break the glass, Wired Beans exchanges it into a new glass for the customers’ lifetime. Unfortunately, this compensation system is only valid in Japan. However, if you or your friends are in Japan, you can use this compensation system. 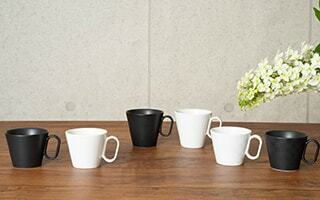 Wired Beans is the first brand in Japan that add “lifetime compensation” to the glassware. What are the features of sake glasses? A glass changes the taste of Japanese sake?!? As I explained, these sake glasses are exclusive to Japanese sake. There are 3 types of sake glasses; “KAORI”, “UMAKUCHI”, and “KARAKUCHI”. You can change the glasses depends on the kinds of Japanese sake. Also, you can taste same Japanese sake in different sake glasses. You can drink more delicious sake, and enjoy the difference of taste by glasses. 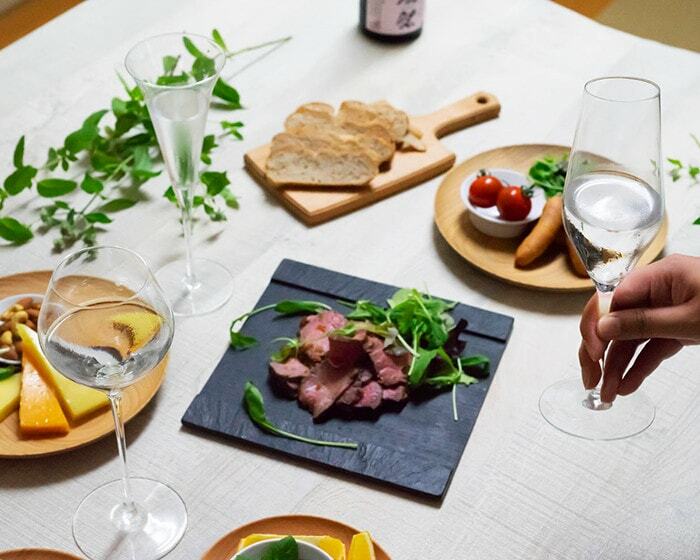 In addition to Japanese sake, you can enjoy dry and sweet champagne or wine with 3 different sake glasses. 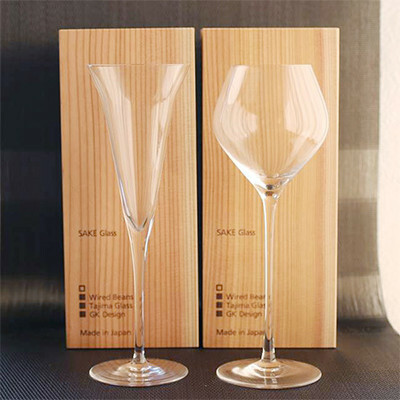 At first sight, the sake glasses have “simple, but unique” design. All 3 types of sake glasses are common design as wine glasses. However, KAORI, UMAKUCHI, and KARAKUCHI has polished and unique design. 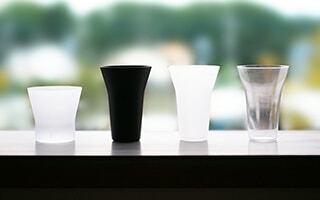 The sake glasses of Wired Beans are designed by “GK Industrial Design.” Their design is characterized by simple, but long-lovable design. 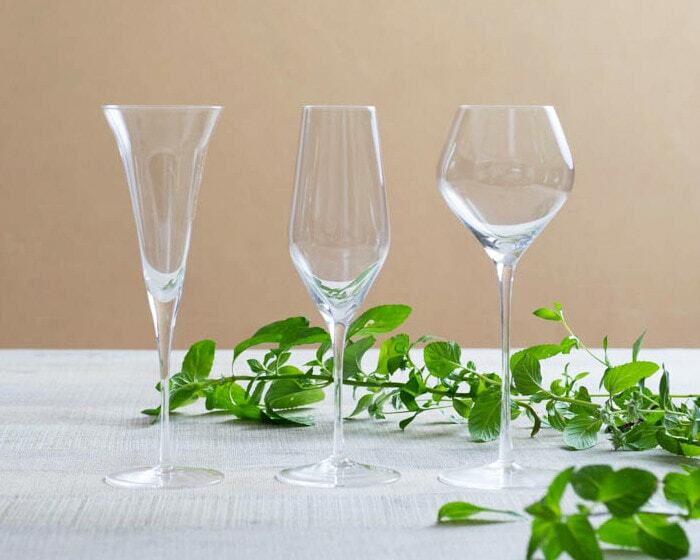 All the glasses are produced by skilled traditional craftsmen one by one. 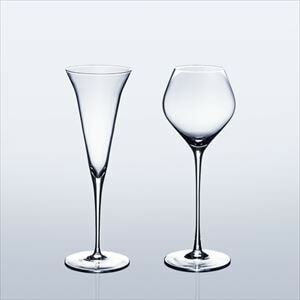 In particular, the long stem of KARAKCHI glass is only possible by handmade by skilled craftsmen. Please enjoy the beautiful and delicate form of the sake glasses. 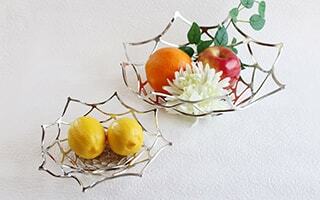 Japanese glass craftsmen produced it for Japanese sake. This point is already explained, but “lifetime compensation” to glassware is rare. We cannot see similar system in the world. Sake glasses of Wired Beans can be exchanged into new one regardless of date of purchase or reason of breakage. 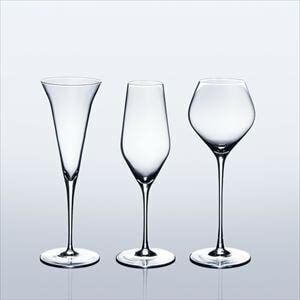 If you send high-class glassware such as Baccarat, Saint Louis, RIEDEL, or LOBMEYR, you worry about breakage. In this point, you do not have to worry about breakage of Sake glasses of Wired Beans. 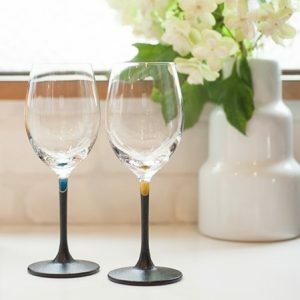 Also, when you use delicate wineglass in your home, people who wash it, carry it, and drink it care about the glass. With “lifetime compensation,” all people who use the sake glass do not have to worry about breakage. 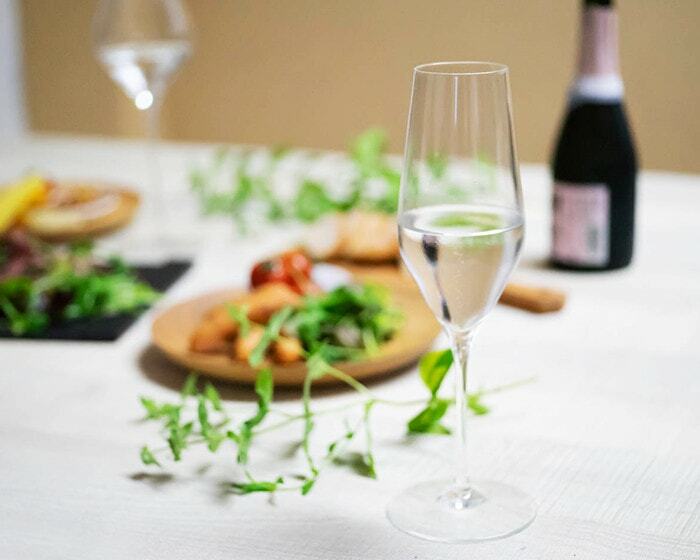 Everyone can use high-class wine glass at ease. So, if you are in Japan, or would like to send gifts to friends in Japan, we recommend these sake glasses. This unique compensation system is irreplaceable. What are the types of sake glasses? Wired Beans offers 3 different types of sake glasses; KAORI, UMAKUCHI, and KARAKUCHI. The glasses are designed for all sake lovers. 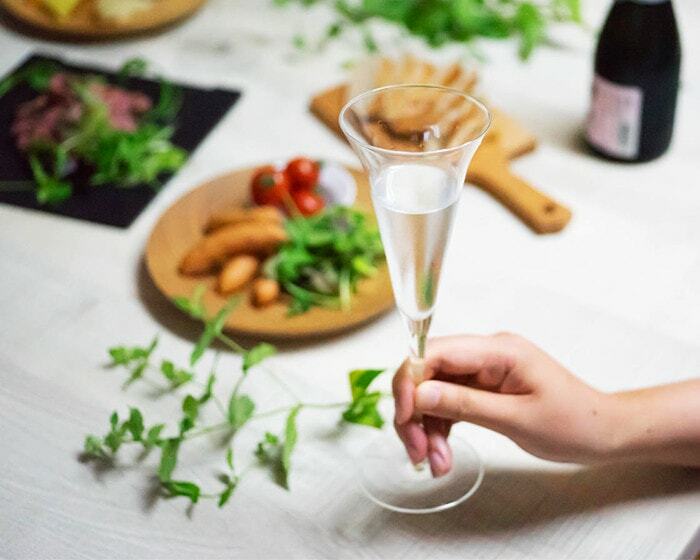 People can taste each feature of Japanese sake at a maximum. KAORI has funnel shape. This sake glass is perfect with “Daiginjo” or “Ginjo.” These types of Japanese sake have rich smell and light taste. 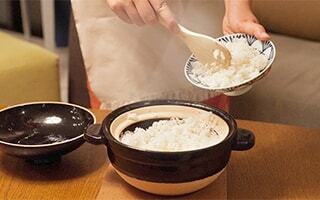 Just before you drink sake, the rich smell is swallowed up, and it spread in your mouth. The funnel-shaped glass makes the flow of Japanese sake smooth. So, the taste spread on your whole tongue. You can enjoy fresh smell and a little sour taste to the full. 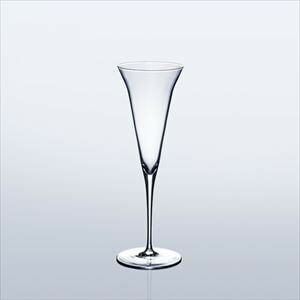 For middle-dry to sweet champagne, this KAORI glass is suitable. UMAKUCHI has oval shape. This sake glass is prefect with “old sake” or “matured sake.” These types of Japanese sake have strong and complex smell that often likened to the smell of dry fruits or spice. Also, these types of sake have thick mellow taste. 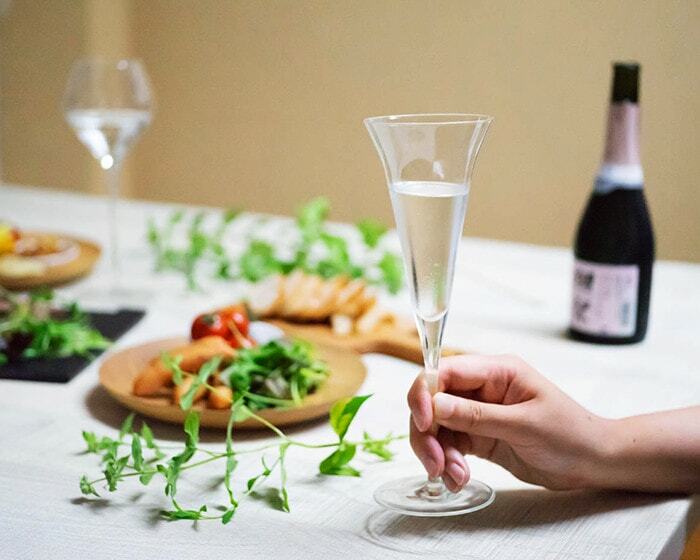 This sake glass is also recommended for sparkling sake. KARAUCHI has balloon shape. This sake glass is perfect with “Junmai-shu.” These types of Japanese sake have plenty of body, and calm smell. This glass has a little narrower top than its middle part. This shape temporally stops the flow of sake so that sake stay longer in your mouth. You can taste complex taste of Japanese sake. 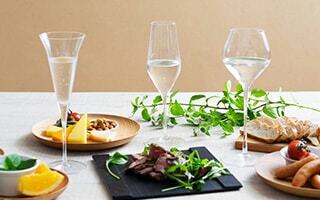 For dry champagne or white wine, this KARAKUCHI glass is suitable. 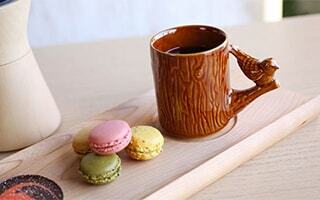 Wired Beans and Japan Design Store recommend KARAKUCHI glass. We have never seen such a balloon-shaped glass on the long stem. The glass itself provides unique elegant atmosphere. 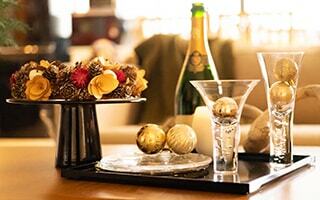 Most family have at least one wine glass or champagne glass. 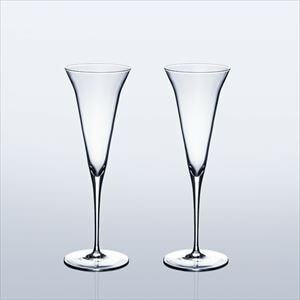 However, the unique design of KARAKUCHI is not similar to other glasses, even you have high brand glassware such as Baccarat. 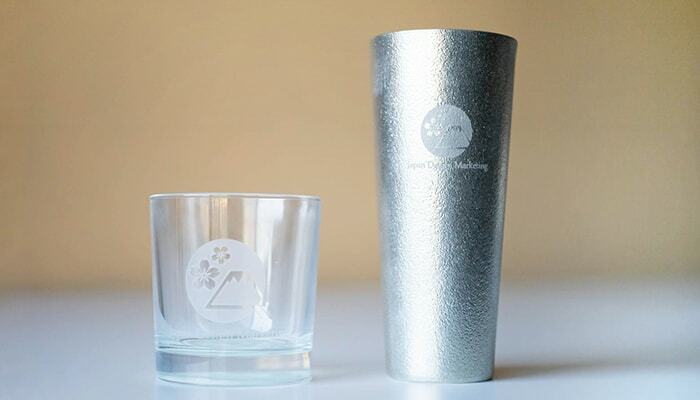 If you look for the glass or tumbler for beer or juice, Wired Beans offer beautiful frosted glassware. Please see this page, too. 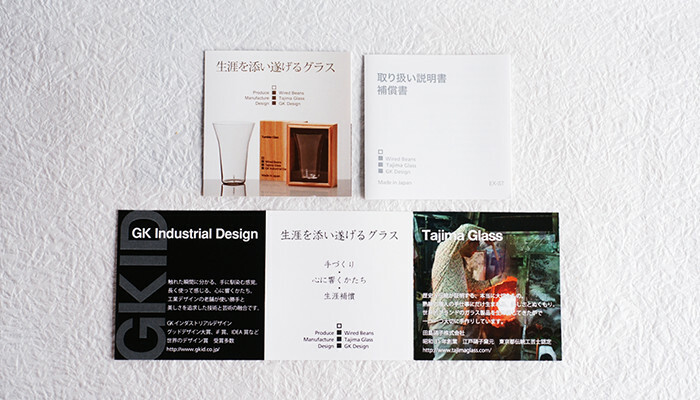 “Eternal Glass for your lifetime” won GOOD DESIGN AWARD in 2010, 2012～2014 in Japan. In 2014, the glass won Red Dot Design Award in Germany. Also, the glass won Bronze award in International Design Excellence Awards in U.S.A. Furthermore, the glass won Special award in German Design Award in 2016. This award is an award for selecting most excellent design from the products which won international design awards. Therefore, nomination for the award itself is honor. In the world of design, this award is called “Award in Awards.” It is an authoritative design award. Pair sake glasses for a present! 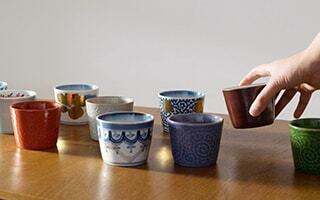 Sake glasses of Wired Beans would be great gifts for Japanese sake lovers, wine lovers, or champagne lovers. For wedding gifts, we recommend pair glasses. All the sake glasses are within Japanese cedar boxes. 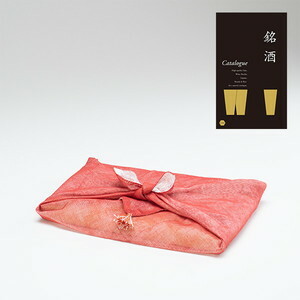 For pair glasses, we prepare 2 glasses in 2 cedar boxes. 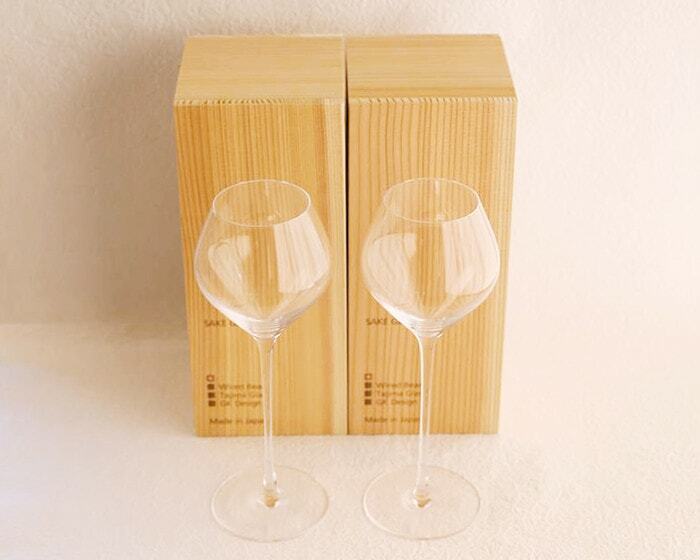 If you send these sake glasses as gifts, please tell the recipients that please keep “wooden box (or exclusive paper box)” and “compensation card”. They are necessary when they exchange it into a new glass. 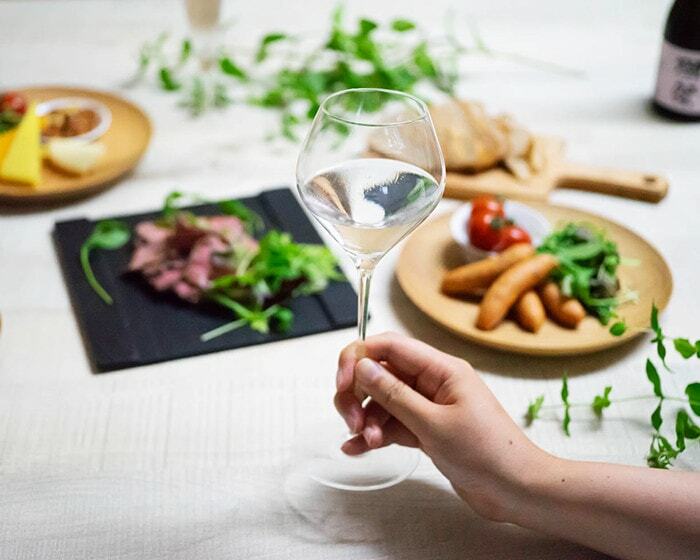 The stylish sake glasses are produced by Tajima Glass in Edogawa ward of Tokyo. 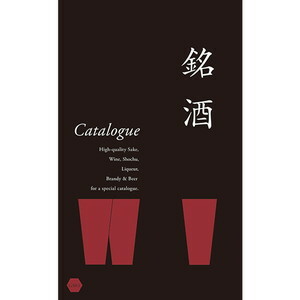 Matsutaro Tajima established Tajima Glass in 1956. 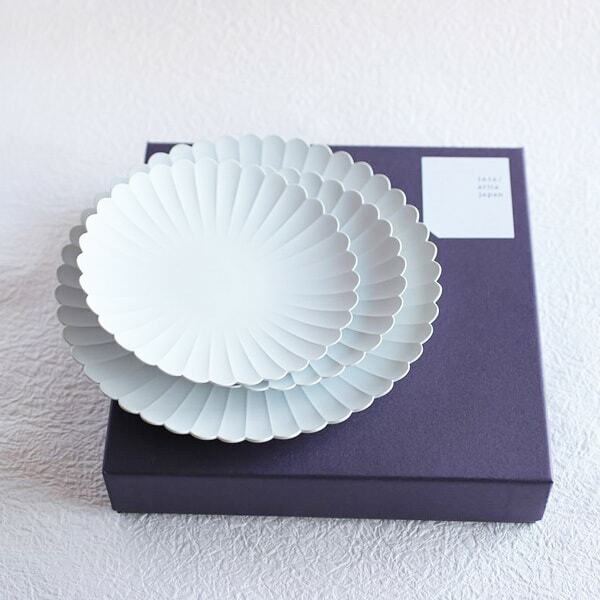 It produces “Edo Kiriko” and “Edo Glass”, which are traditional crafts designated by Tokyo. 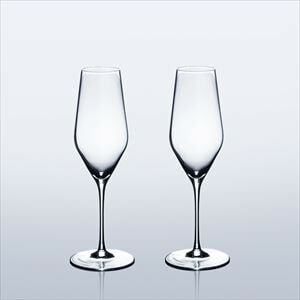 They especially good at delicate skill such as thin stem glass or Usuhari (thin) glass. 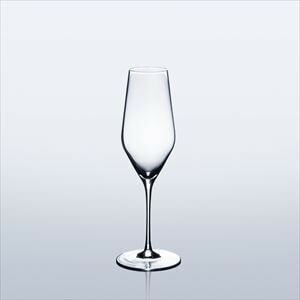 They produced the special glassware for high-class hotels or restaurants in Japan. 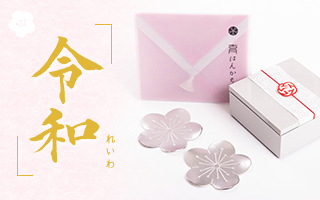 The “Eternal Glass for your lifetime” is handmade by craftsmen of Tajima Glass. Producing a glass with thick bottom and thin edge is extremely difficult. Also, Usu-fuki glass has uniform thinness. 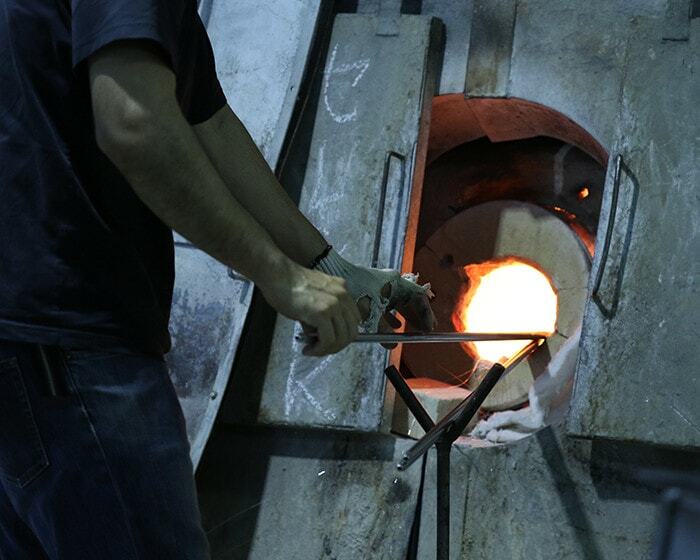 The glassware filled with skill is only possible to be produced by craftsmen’s skill of Tajima Glass. In addition, the material of the glass is “transparent glass.” Transparent glass is a glass material that has similar refractive index and transparency of crystal glass. It consists of some metals such as barium or lithium. 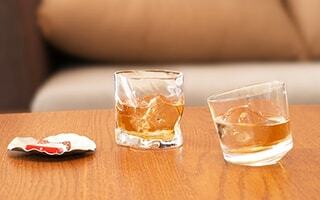 It does not include lead, which is often included in the crystal glass of Baccarat. So, it is a next generation material that is gentle for people and environment. 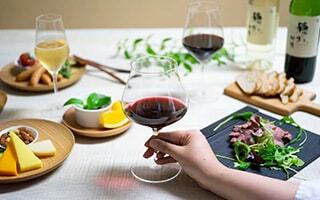 The glassware of Tajima Glass is not mass production by pouring glass into mold. Please see the beauty of handblown glass by craftsmen. It does not have joints. * This movie makes sound. What is GK Industrial Design? 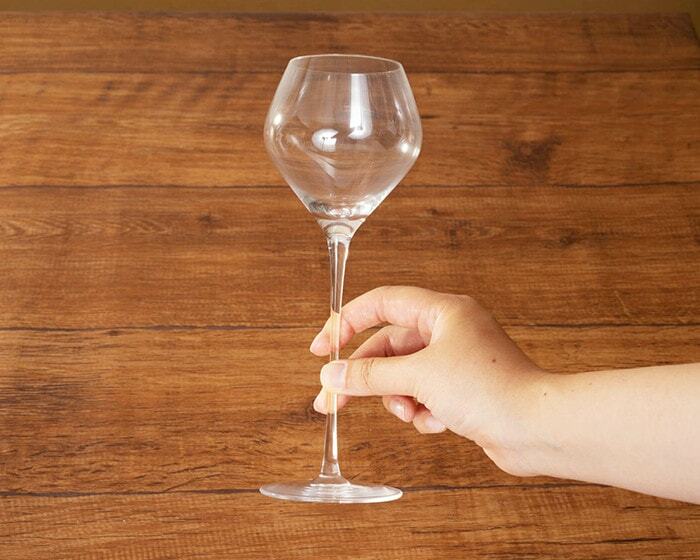 The feature of the sake glass is simple, but long-lovable form. We get fond of the glass more as we use it. 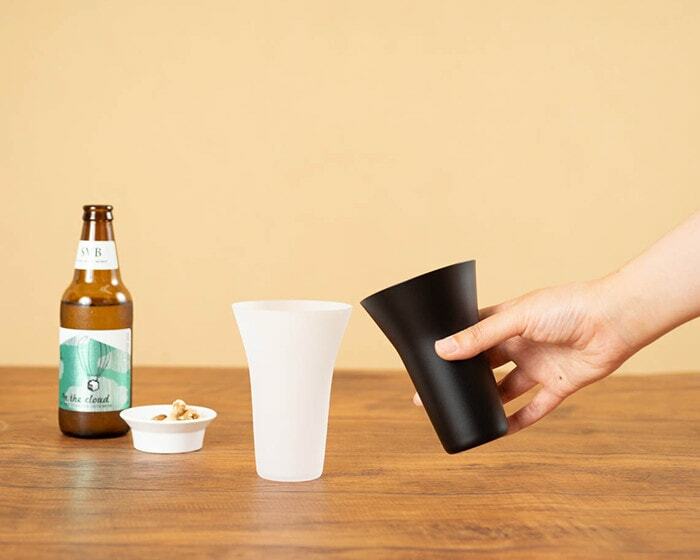 The sake glasses are designed by a long established industrial design office “GK Industrial Design.” They pursue the usability and beauty. So, the sake glasses were born with a fusion of skill and art. 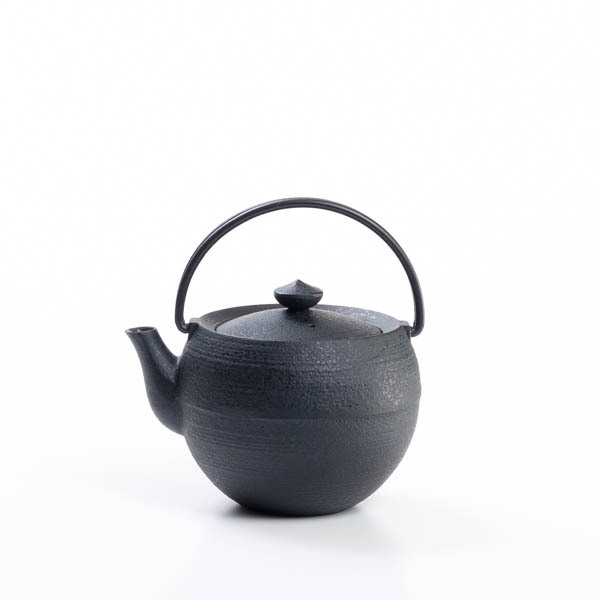 GK Industrial Design is one of the representative long-established design office in Japan. In 1952, Kenji Ekuan established a part-time job group GK (Group of Koike) with his friends under Dr. Koike. 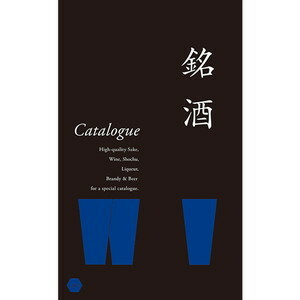 At the moment, he was a student of Tokyo University of Arts. After that, GK developed into a design office. 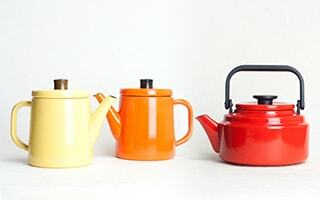 Even we do not know the name of GK Industrial Design or Kenji Ekuan, their products are so famous that most Japanese people have seen one of them at once. We cannot introduce all the items of them. GK Industrial Design produced a lot of famous products in Japan. Also, they won hundreds of design awards such as Good Design Award or Red Dot Design Award. 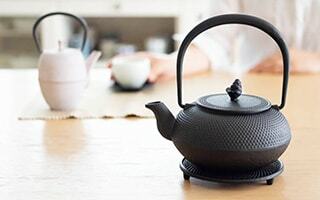 When you visit Japan, you can find the items of their design. What is the lifetime compensation? First of all, as I explained above, this lifetime compensation service is only valid in Japan. 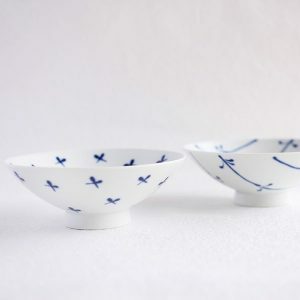 But we would like to introduce the details of this service for those who are in Japan, or planning to send these sake glasses to friends in Japan. Well, the way to exchange glasses is very easy. Please put pieces of broken glass in the wooden box, and send the box to Wired Beans. Wired Beans will send a new one regardless of the date you purchased or reasons of breakage. The broken pieces of glass will be recycled and become the glass material for new glassware. So, you can send happiness to other customers. Since we started to sell these sake glasses, customers can select traditional thin glasses as wedding gifts or any other gifts at ease. They do not have to worry about the breakage. All the sake glasses are within Japanese cedar box. 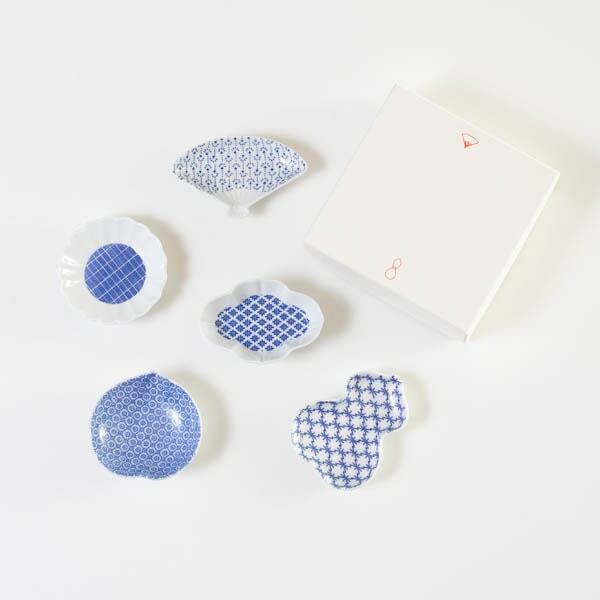 As presents for dearest person, these sake glasses have been popular. Rules of compensation If you break your important glassware, Wired Beans will exchange it into new glass. The first time is for free. For the second time and after, customers need to pay the commission. Payment should be done by cash on delivery. Wired Beans cannot compensate in the following situations. 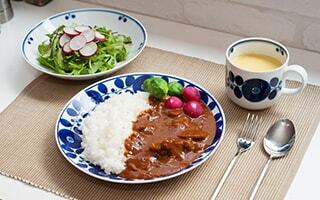 * Without the name and address of customers, and date of purchase in the compensation card. Or, if customer alter the contents of card. About compensation card Compensation cards are in the all the items of Wired Beans. The compensation card is valid only in Japan. The card cannot be reissued. Wired Beans cannot meet the demands from the overseas countries. We appreciate your kind understanding. * Wired Beans may stop this service from necessity of the makers or atelier. 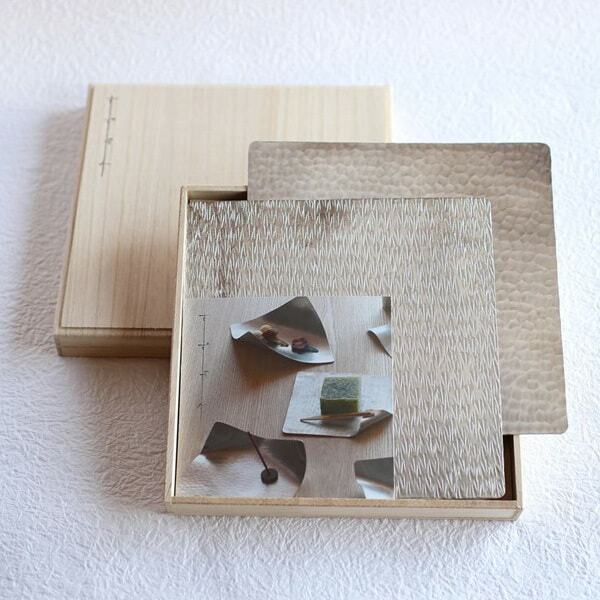 The way of exchange If you kindly purchase the glassware of Wired Beans in Japan Design Store, please send broken pieces of glass and compensation card in the wooden box to Wired Beans. Wired Beans will send a new glass to you. * Customers need to pay shipping cost for sending and returning the product. * Please keep the wooden box or exclusive box and compensation card. Contact from and address for exchange Wired Beans Inc.